About 4 years ago our family started a trend. Back then all the cool kids had a Nintendo DS. We, being the rebels we are, decided to buck the trend and got our kids snazzy new iPods instead. Our reasoning being they were actually cheaper than a DS, the games were mostly less than $5 each (DS games are stupid expensive! ), and they could serve multiple purposes. Being the geek I am, I researched the iPods pretty extensively prior to giving them to my kids. The fact is an iPod is pretty much a small computer, complete with unfettered email, Internet, video, and chatting straight out of the box. 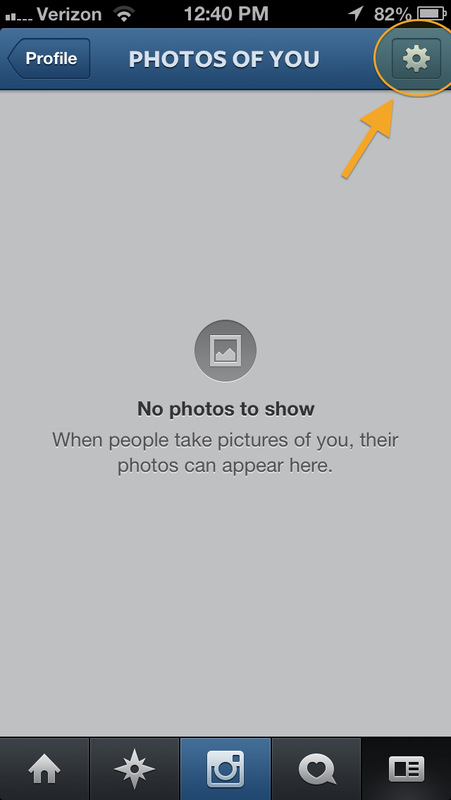 Fortunately, Apple includes pretty extensive controls to restrict access to all these scary apps and settings. You just need to know what to restrict. The purpose of this post is to help you identify all the settings and restrictions you may want to consider as you set up your iOS device for your young child. Pretty much all the restriction settings can be found by opening the “Settings” app and selecting the “General”, then the “Restrictions” menu options. 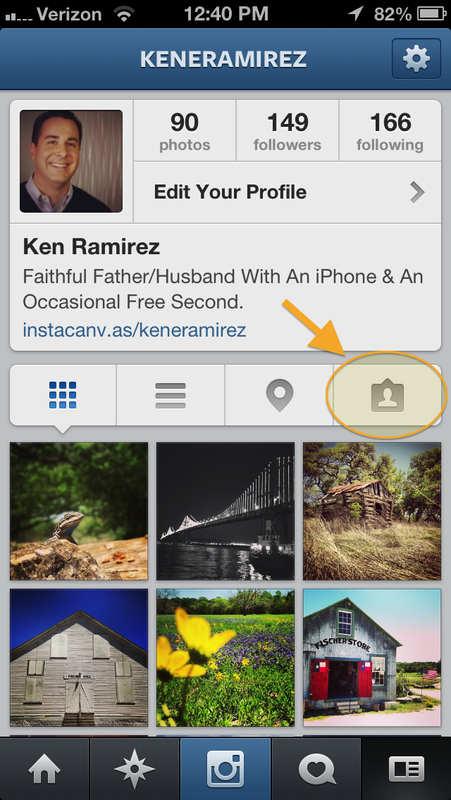 Once here, click the “Enable Restrictions” button and enter a passcode. 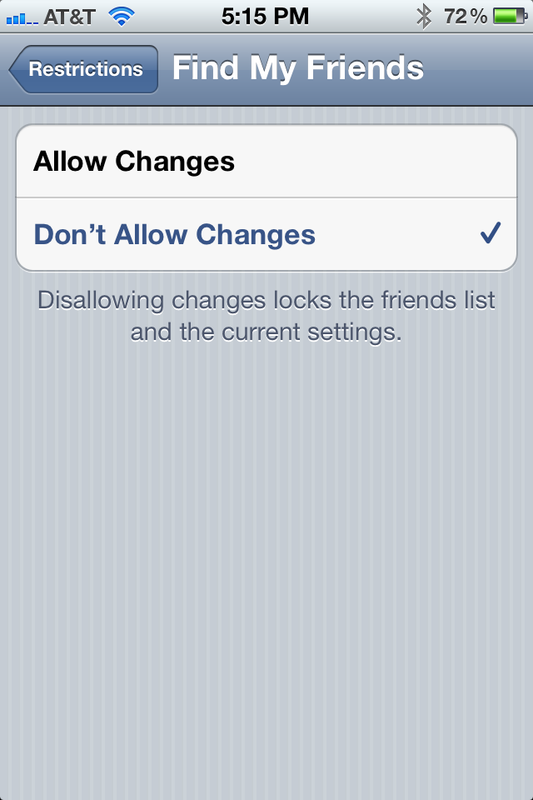 Once you enable restrictions, the first settings to adjust are which apps you want to disable. 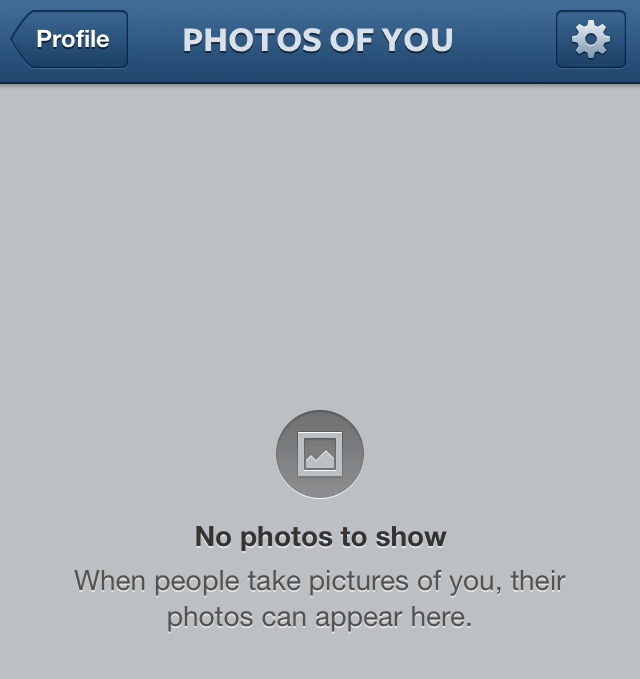 I’ve tried to share a quick reason or two as to why or why not to disable a particular app. Safari – This app lets you browse the wide open Internet. I highly recommend turning it off for children. There are a number of great kid-safe Internet browser apps you can install later if you want to let your kids surf the Internet using their iOS device. One of the best ones I’ve found is available for free from AVG. YouTube – Supposedly you can set age-specific restrictions which should apply to this app, but in my house we just keep it turned off to be safe. 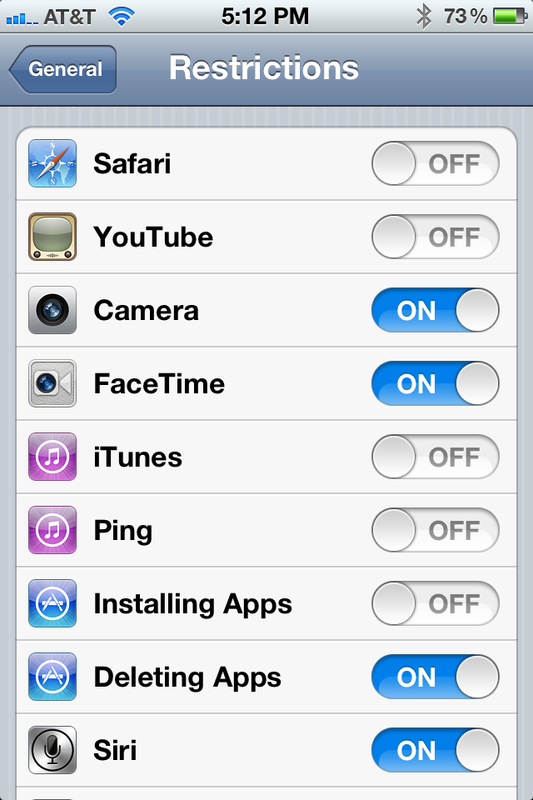 Camera – If you’re worried about your kids taking inappropriate pictures, then you may want to turn off the camera app. FaceTime – This app lets you video call people. This can be a great experience with grandparents and when Mom/Dad’s gone on a trip, but it’s also a wide-open tool for anyone to see and communicate with your child. I’d recommend only turning this on when you are there to supervise use of it. 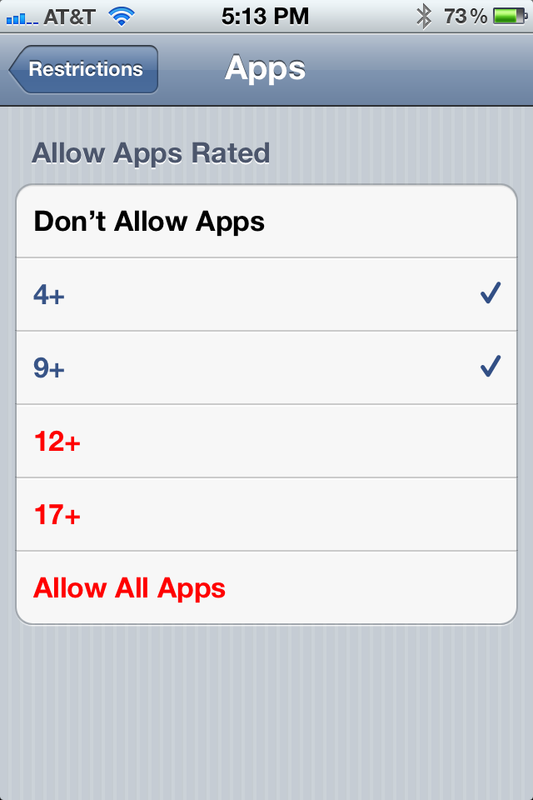 iTunes – This app is also supposed to abide by the age restrictions we’ll cover below, but unless you want your kids buying movies and songs unsupervised, I’d recommend turning this off. Ping – This app is a social media add-on to iTunes where you can talk with others about your music preferences and such. If you’re going to leave iTunes on, I recommend keeping Ping turned off for kids. Installing Apps – If you set up your age restrictions, you should be able to let your kids install apps without too many concerns. I prefer to supervise and approve all app installations, partially because I worry about the effectiveness of the age restrictions and partially because I want to be sure they aren’t overloading the device with so many apps it affects the device performance. 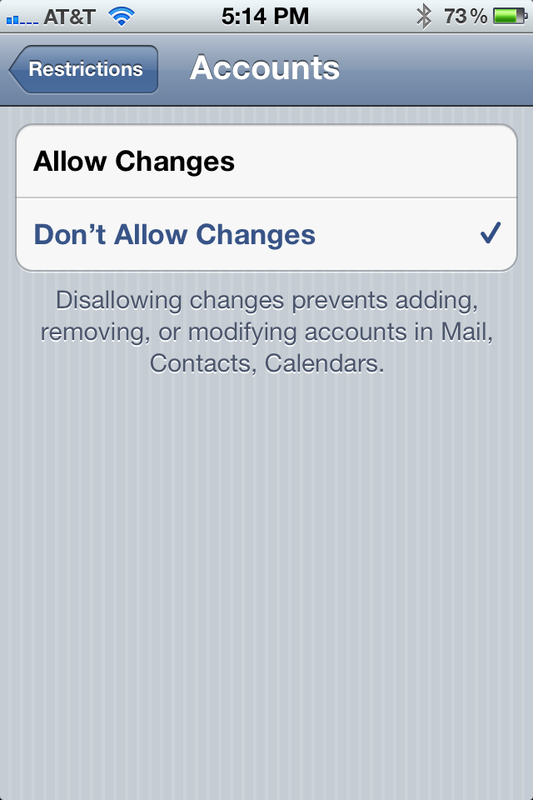 Deleting Apps – This is helpful with young children who may inadvertently delete things. Siri – This app lets you ask the device for advice (only certain iOS devices have this option). Keep in mind, it will answer ALL sorts of questions. I’m old fashioned in that I believe parents should be the only ones answering certain kinds of questions. 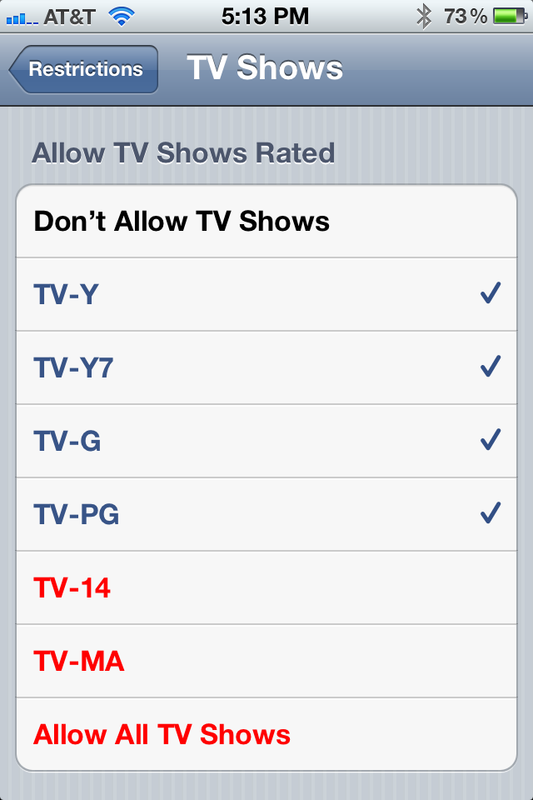 Additional settings include the ability to restrict content based on specific ratings. These age-specific restrictions apply primarily to Apple apps such as iTunes, YouTube, and installing Apps. You’ll want to be sure to turn off “In-App Purchases”. 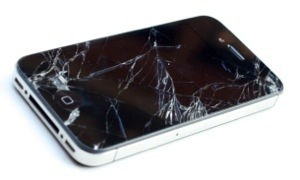 Otherwise you may get some fun surprises when your next Apple bill arrives. 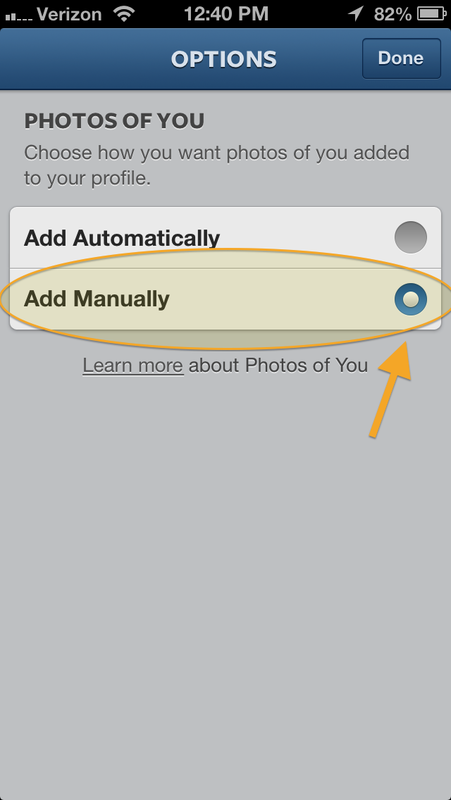 And finally, you can restrict the ability to make changes to the device’s “Location”, “Accounts” and “Find My Friends” settings. 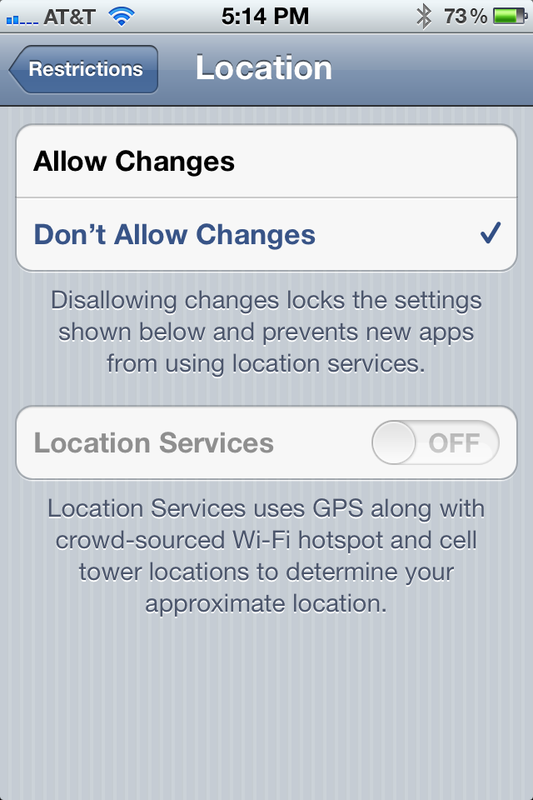 If the device is GPS enabled, you can lock down the location settings. This comes in handy with older kids who are lucky enough to have their own iPhone. With the Location and Find My Friend settings locked down you have the ability to keep tabs on their location and they don’t have the option of selectively turning this great feature off. By restricting the Accounts settings your child will not be able add additional email accounts, nor change any of the email settings. In this post I describe how to setup a Gmail account for your child to use that lets you monitor all their email activity. By locking down the Accounts settings, you can set-up the email for your child on their iOS device, enter the password, and then they can use email all they want without having access to the Gmail settings online. Now you know how to make your iOS device safe for a child of any age. Hopefully your kids enjoy them as much as mine have.